One of the finest bead-and-wire artisan in Zimbabwe, Patmore was born in Chitungwiza, the city where bead and wire art originated in the early 1990s. His specialties are bead animals, cars, and motorcycles. He only recently expanded his art to include nativity sets. This may explain the visible clash between the plain and abstract nativity figures and the vivid realism of hippo, flamingo, warthog, rhino, and lemur. This setting attempts to visualize the opposition between these two worlds: a world of fright, violence, and darkness symbolized with the ferocious beauty of the animals, and the somewhat remote and removed world of hope and good will pictured in the solemn and peaceful simplicity of Holy Family and Magi. The ladder hovering in the cloud is a very old symbol of spiritual ascent and progress. It is also a bridge between good and evil, between the material and the spiritual world. Ultimately, the ladder stands for Jesus Christ himself. Is it by climbing this ladder that we will attain our own good measure as Christian. 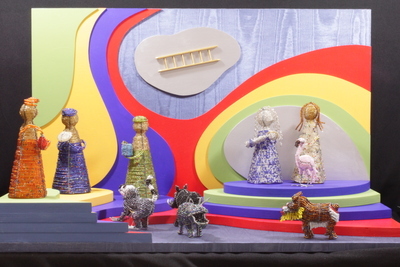 Bead and wire nativity set created by Zimbabwe artist Patmore. Figures depicted are Mary, Joseph, three wise men, a flamingo, a lemur, a wart hog, a hippopotamus, and a baboon. Exhibition label written by Father Johann G. Roten, for exhibit entitled "African Symphony" held at Roesch Library, University of Dayton.